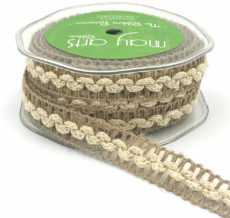 This fancy braided natural jute trim ribbon is available in 1/2 inch by 10 yards. Great for adding a little fun to a gift wrap or craft project! This burlap trim is in the style of a gimp trim. It can stand alone as an edging on paper crafts and stationery or invites, as well as be mixed with beads or stones for jewelry. Mix this ribbon with our other cotton ribbons for a natural motif, or combine with silk for a bohemian vibe. Use on linen covered upholstery items as the trim to hide visible staples or seems where the wood meets the fabric. Good for every occasion from weddings to kid crafting days!